People love ASOS: It's the world's most visited fashion site, and is reportedly set to turn over $1.5 billion this year. That's a lot of clothes, which means that people need to work hard to get this stuff out to customers. In October 2014, UK Prime Minister David Cameron visited the company's distribution warehouse in Grimethorpe near Barnsley, South Yorkshire, which is built on the site of a former coal mine. Cameron praised ASOS for providing much-needed jobs for a community desperate for investment. Before its pit closed, Grimethorpe was a stronghold for the mining unions. It is famous for being the location of the movie Brassed Off, the real-life tale of the colliery brass band who refused to die when former PM Margaret Thatcher shut the mines. A year after the pit shut in 1993, Grimethorpe was named the poorest village in England. But the investment of ASOS and other companies, as well as improved traffic connections and new housing, all seemed to signal a bright post-New Labour future for the area. As recently as two years ago, the BBC were praising Grimethorpe as "the village that wouldn't die." 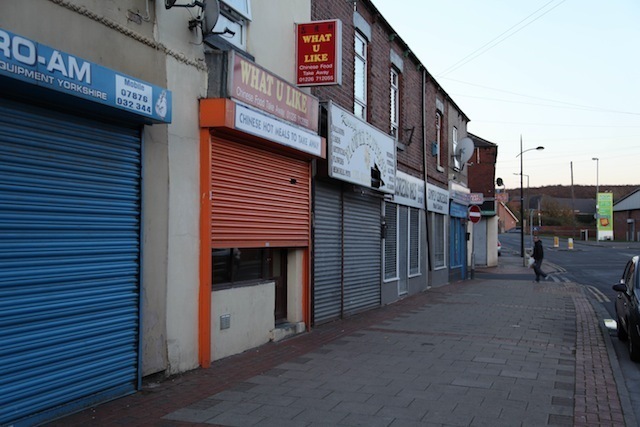 Boarded up shops on Grimethorpe high street. Photo by Helen Clifton. But when VICE News visited Grimethorpe recently, it was tough to feel so optimistic. In the dim light of the afternoon, the shutters of the high street shops were all closed, and only the grocery chain store Asda, owned by Walmart, was open. The streets were dead. While it's clear that new jobs were needed in the area, it's less clear if those jobs are actually all that great. Numerous former workers and unions compared the vast ASOS warehouse to a modern-day sweatshop. They told VICE News that bullying is rife, health and safety rules are ignored, targets are exhausting and impossible to reach, and managers refuse to allow unions access. ASOS and their contractor, Norbert Dentressangle, disputed this, assuring VICE News that they take "immense pride in providing jobs and career opportunities for people in and around the Barnsley area... many of which were filled by local people who were previously unemployed." Ex-workers say this is just PR. "Once you've exhausted all the people from Royston, from Grimethorpe, from Barnsley, [ASOS] just get all the people in from the continent who are more than prepared to work under these conditions," a former factory team leader told VICE News. Between the summers of 2011 and 2013, long-term youth unemployment in Barnsley rose by 237 percent, and long-term unemployment rose by 113 percent. As the Barnsley area continues to struggle economically, ASOS's recruitment of large numbers of eastern European workers is causing resentment. A quick Google search reveals a list of Polish job ads for ASOS. When VICE News visited the warehouse, all the workers I spoke to outside were Romanian. Complaints about the working conditions spanned across different nationalities. VICE News spoke to both Polish and British workers who talked about the poor working environment. Those whose job it is to select orders from the factory's stock push heavy trollies across five floors and walk miles per shift, with as little as half an hour's rest. The basic wage is £6.77 ($10) an hour. A memorial for those who died in Grimethorpe colliery. Mining used to be the main source of economic activity in the area. Photo by Helen Clifton. The employees told VICE News they are exhausted by the demands of a bullying targets regime and a "flex" system, in which shifts are worked according to demand. Staff are told to work with just two hours' notice and to go home when they are not needed. "It's the worst system I've seen in my life," one ex-worker told VICE News. "People end up doing 90 to 100 hours a week, 12 to 13 days on the run. If somebody's face didn't fit they would soon have them out of there. They are on your case 24/7 until you snap. They rule the place with an iron fist." Ex-workers and the GMB trade union said that staff turnover is huge, with agency workers often laid off to avoid giving them the same employment rights as permanent workers. Night-shift workers claimed they would face disciplinary action if they didn't work shifts over Christmas. "You have got to do it; there is no excuse. They didn't treat us like humans. I was under the impression that if you joined a union then you would get the sack. I was too scared." ASOS and Norbert Dentressangle insist they provide a "safe and modern working environment" with "high levels of colleague engagement... satisfaction... and operational efficiency." Again and again workers told VICE News the opposite was true. One, who had worked in many similar warehouses, said that systems at ASOS are outdated and dangerous. "If you work the way you should it would be impossible to reach targets. People are threatened and encouraged to break health and safety rules — but if they report the accident they'll be disciplined for breaking those rules," he said. The allotments (community gardens) at the edge of Grimethorpe sit in stark contrast to the bleak uniformity of the distant warehouse. Some of the plot-holders spoke to VICE News and a younger man told me he has applied twice for work at ASOS, with no luck. They all blamed the fact that the factory is, "full of foreigners". "It's Thatcher who started all this," one said. "I was a Labour man through and through. But now I'm not so sure." Another said he has already switched political allegiance to the right-wing, anti-immigration UKIP party. Mining banners in the Northern College, Barnsley. Photo by Helen Clifton. The GMB trade union has been trying to stop people blaming immigrants and target the company instead. It has held recruitment drives outside ASOS to encourage workers to join the union and attempt to embarrass the company into improving pay and conditions. Nothing has worked. ASOS won't even allow GMB to see the inside of the warehouse. Bill Chard, a GMB official and ex-miner, told VICE News that Barnsley now runs the risk of becoming a "breeding ground" for low-paid jobs. "It's the unacceptable face of capitalism. I know a couple of companies who have come from Leeds [about 25 miles away] and dropped their terms and conditions. Where one company gets away with it, they all come along and do the same thing." Former miner Paul Winter used to work in Grimethorpe colliery. He met VICE News in his current workplace, Northern College, an educational institution for adults that is proving more popular than ever with young people desperate to get qualifications to escape the low wages of the area. It is unexpectedly beautiful, a former stately home sold to the council to be used as a place of learning. "I hope it always stays this way," he told VICE News, while sat in the college's library adorned by old union banners. Given the history of the area, Winter said the location of the warehouse is almost like a "slap in the face." "Kids have no idea why unions exist and what they are about. We try to instil the importance of being involved," Winter added. "Collective bargaining changes things... wherever you go in Barnsley, there are still ex-NUM [National Union of Miners] people. They've still got that mining mentality. And even now, they will not be walked on." Romanian ASOS workers waiting for the bus. Photo by Helen Clifton. And yet there seems to be little left here representing the interests of working people. None of Grimethorpe's councilors wanted to talk to VICE News about ASOS and local Labour MP Michael Dugher did not respond to requests for a comment. GMB met with Dugher to look for support, but didn't receive any help. Meanwhile, the far-right British National Party is trying to capitalize on the situation. Their website proclaims it a "disgrace" that ASOS "no longer want to employ local people." Down the road from the warehouse, Romanian ASOS workers smoked cigarettes in the fading light as they waited for their buses to Barnsley. They were reluctant to talk, but eventually said a few words. They told VICE News that local workers don't want to work at ASOS — but neither did they. Wages at home are around $295 per month, they said. "We are all exploited," one said. "But we all need the jobs."